Serge Lutens Jeux de Peau is a somewhat controversial fragrance. But there is one aspect of Jeux de Peau on which I suspect we can all agree: its name is totally creepy. “Skin Games”? “SKIN GAMES”??? Serge Lutens marketing team, I refuse to believe that not a single one of you has seen Silence of the Lambs. Jeux de Peau is not as bizarre as its promised bread notes might suggest, but it is an unusual fragrance. Here is what I smell: burnt toast and apricot jam. While that might sound somewhat unappealing, I assure you that Jeux de Peau smells great. 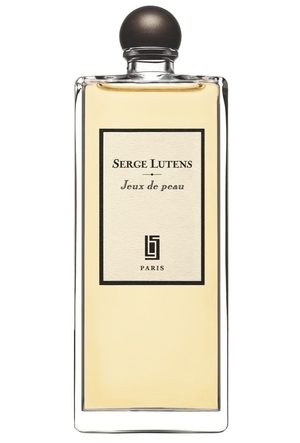 Serge Lutens has used this burnt, roasted effect before in scents like Un Bois Vanille, and it truly works in Jeux de Peau. The burnt effect is necessary to offset the sweetness of the apricot jam note. The toast is just barely bready, and certainly not yeasty (I love the smell and taste of yeast, but I doubt it would have worked here). The apricot is ultra-sweet, so sweet that it comes across as candied rather than fruity. I don’t find Jeux de Peau feminine (or gendered at all, really), but it is an extremely sweet fragrance. Do I like Jeux de Peau? Very much. This fragrance positively sparkles. Would I wear Jeux de Peau? Probably not. As I have mentioned before, I tend not to wear particularly strange or challenging fragrances because I am already weird enough without them. But even so, I am glad that it exists. Jeux de Peau is that rarest of things: an intelligent gourmand fragrance. I sniffed this the other day. Like you, I liked it but I dunno if I’d wear it. Also, that cat … oh that cat in that basket. The lolcat version of Silence of the Lambs looks only slightly less creepy than the real thing. I love that you are “already weird enough” without them. I expected to find this unwearable, but it’s not. It made me chuckle quietly to myself… and then I wanted coffee to go with my arm. Cannot imagine paying Serge prices for it, though. 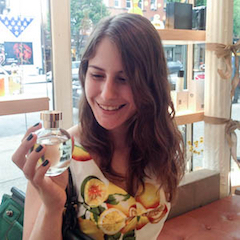 Your take on perfumes is always such a surprise! I agree that Jeux de Peau would go very nicely with coffee. What Abigail said! This was not for me sadly – I have the knives out for most bready scents, and this was no exception. ScentScelf (note near miss name) was with me when I smelt it, and can vouch for the face I made. Where does the aversion to bread notes come from? You’re not Atkins-ing, I hope?? I agree with Ari’s comment, it is intelligent. I couldn’t find the right adjective but yes, intelligent it is. But I really hate sweet gourmands. And as much as I love uncle Serge for his hannibalesque sense of humour I have to admit that this one is the SL fragrance that I do not like. Uncle Serge does have quite a sense of humor! But Jeux de Peau is so sweet, I can’t blame you at all for finding it overwhelming. Even I found it a bit much! I liked this perfume enough to buy a decant (after I tried it in a store on skin and realized that I liked it). It was my first decant purchase ever so not only I got a perfume that I enjoy wearing from time to time but also it became a story for my blog – so a double win for me. I love the movie that horrifies you so much so I have no problems with the perfume name. But the scent is … special enough for me not to seek a full bottle. At least I think so now, when I still have most of my decant. I’m so glad that it worked out! Need to go read that post now. I have actually still never purchased a decant. What environments or occasions do you suppose this would be appropriate for? Rick, that was the problem- I couldn’t really think of a situation in which I would wear this! Maybe if I was an artsier person, I would wear it to edgy Brooklyn art exhibitions. I like it a lot too. And the name isn’t as creepy in French- it has more sexual conotations. My husband doesn’t like it on me though, he thinks it smells sweaty. Everything sounds better in French! I’m sorry that your husband doesn’t like it, I can’t imagine it being “sweaty”! LOL! I think that you would remember it if you had tried it. It doesn’t smell much like anything else! There is no remedy! …. 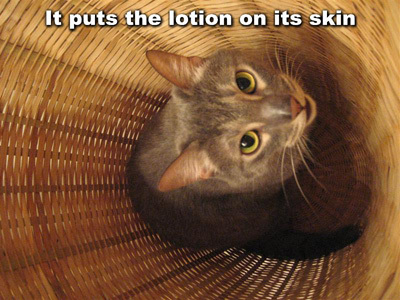 It puts the lotion on its skin…..